“Peri” is the Greek word for “around” and “don't" is related to dental or teeth. So, periodontal disease refers to disease of the area around a tooth. This comes about by food and bacteria collecting along the gum line to form plaque. If this plaque is not removed it can lead to a hardened form of plaque called tartar or calculus which sticks strongly to the teeth. It is caused by the continual accumulation of minerals from saliva on plaque on the teeth. Plaque can be removed by brushing but calculus or tartar is too hard and attached too firmly to the teeth to be removed with a toothbrush or by eating pet food, even if it is in a dry pellet format (kibbles). The tartar is irritating to the gums and causes inflammation; this is referred to as gingivitis and can be recognised by bad breath and reddening of your pet's gums. When the gingiva or gums become so irritated that there is a loss of the connective tissue fibres that attach the gums to the teeth and the bone that surrounds the tooth, this is known as periodontitis. If the calculus is not removed, it builds up under the gums. It separates the gums from the teeth to form “pockets” and encourages even more bacterial growth. At this point, the damage is irreversible and called periodontal disease. It can be very painful and can lead to loose teeth, infection, abscesses and even bone loss of the jaw. What signs would you see in your pet? In cases where the condition has not deteriorated significantly you may not notice any signs and therefore it is important to lift up your pet's lips and look into their mouths to see if any calculus (tartar) has started building up. The sooner one addresses the onset of periodontal disease, the less likely your pet is to lose any teeth and the better the chance of preventing further complications like heart or kidney disease. In dogs we see it more commonly in smaller breeds (yorkies, poodles etc). Their teeth are often crowded together or they may have extra teeth because of retaining some of their baby teeth. Breeds with flat faces like pugs, bulldogs and boxers are also prone to dental disease because their teeth are not always well aligned. In cats it is more common in Oriental short-hairs and Siamese cats. The age of your pet. Dental disease more often affects our older pets and research has shown that more than 65 % of pets older than 7 years of age have some form of dental disease. The food we feed our pets can play a role as well. Studies have shown that hard kibbles are slightly better than soft food in reducing plaque. The grinding action required by chewing this food tends to clean teeth better. Dogs that chew on various toys or special dental chews have less plaque than those who do not. The wrong chew toys can also have an effect. Very hard chews (dried cow hooves) or bones can cause the teeth to break or wear down faster. Many people will then wonder why wild carnivores can eat bones and not have problems. Unfortunately they do! Up to 50% of them have broken teeth as a result of this. We should also remember that they do not live as long as our pets (maximum of up to 4-5 years) and therefore do not often show symptoms, where many of our little ones have a lifespan of nearly 15 years. Can you imagine living with toothache for that long! Some dogs chew inappropriate things such as sticks and stones. This will have the same effect as having the wrong chew toys. Unfortunately, this is a behaviour problem in many dogs and can be very difficult to unlearn. They also often swallow these things, which in turn lead to other major problems. Correct training at a young age is therefore very important. 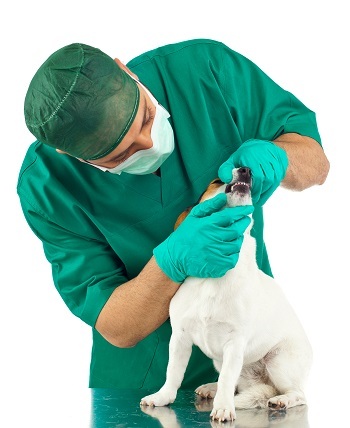 Why do vets make such a fuss about dental health? You might think that bad breath is normal for a dog or cat and that worrying about it is a waste of time. Well, it is not! Bad breath can be just the tip of the iceberg. The sooner we treat dental disease the better. The horrifying thing is that periodontal disease is irreversible and it can also cause major organ disease. Most people do not know that bad teeth can cause heart disease and kidney and liver failure. These are deadly! What can you as a pet owner do about it? The best thing for your pet is to go to his/her veterinarian on at least an annual basis! In human terms this would translate to visiting the doctor roughly every seven years. Your vet will not only check their teeth, but will also quiz you on their general well-being and behaviour. With this information the vet can make an informed decision on how to proceed. Most commonly the vet will suggest a dental scale and polish. This is the same procedure we go for to clean our teeth at a human dentist but with one BIG difference - our pets need a general anaesthetic as they do not respond well to „sit still? and „open wide?. This obviously carries risks, making the general check-up extremely important. Conditions such as heart and kidney disease may affect your pet during anaesthetic. To most of us our pets are very special and much loved. It is our duty to keep them healthy and fit – just as we do ourselves. The small things we do can make such a big difference in their lives, even smelling their breath every now and then!